(Newser) – That Coke bottle you were proud to throw in the recycling bin so it could be repurposed into another Coke bottle may actually be … part of a carpet sample in Mumbai. 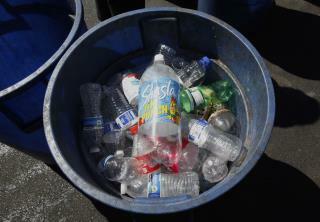 It turns out that a very small percentage of the world's plastic beverage bottles are made out of recycled plastic, with an IBISWorld analyst breaking it down into stark numbers for BuzzFeed: Less than a third of the world's plastic bottles (around 6 billion pounds per year) are recycled, and of that sample, only about 20% is transformed into new plastic bottles. Instead, most of the bottles are sent off to plastics factories in emerging markets, where they're used in textiles such as clothing, bags, and carpeting, and the reason appears to come down to cost. Because new plastic is often crafted out of petroleum, the current low price of oil makes it cheaper to just start from scratch than use recycled materials. Much of what we "recycle", ends up being trucked and barged offshore, to other countries, where it ends up being picked over or buried, in landfills. Its a scam.